The post room, originally uploaded by andytgeezer. 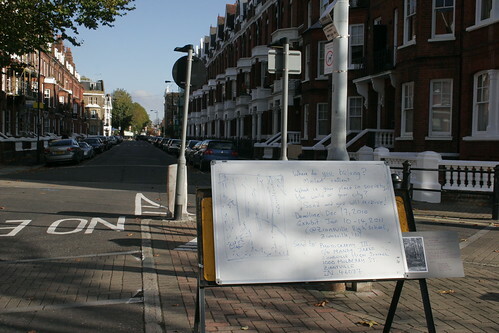 We’re rapidly running out of walls to put postcards on…. my REAL wall – Quitting Quilting Quilling, originally uploaded by andytgeezer. my REAL wall has always been about connecting to people and since it began I’ve loved not just seeing what comes through the postbox but also what people bring me. It’s been great seeing how creative my friends are, and this one made me laugh. Me and Elena were out with L-plate Big Cheese, who put together the phenomenally successful “Tetris Tetris Everywhere” gallery on flickr. I’ve known L-plate since we met in Romania in 2004 and she’s a huge fan of my REAL wall. Having read that Elena was learning quiLLing on my twitter feed, she decided to make Elena a little present, adapted from a quit smoking campaign mug. However, as quiLLing is not a particularly well-known art, L-plate had assumed that Elena was into quiLTing and put one of her custom L-plates on the mug, so that it now reads “Serious about quiLTing?”. D’oh. Quitting. Quilting. Quilling. Chuh! Keep your eyes on your postboxes for some of Elena’s quilling, as she is on a roll at the moment. And not a quilt or a cigarette in sight. Also on the table today are a postcrossing from the US and a letter of thanks from Katie R, who has started to get her pupils into mailart at school. In the background is a cheque from British Gas, which nearly ends the British Gas Saga. After more than 2 months they finally put back our gas meter and sent us a bouquet of flowers and possibly a pair of tickets to a west end show by means of apology, as well as this cheque, which compensates some of the costs that we had to waste. I’ll keep the grumbles aside though, as we now have gas and some compensation, so we can say that this saga is closed at last. 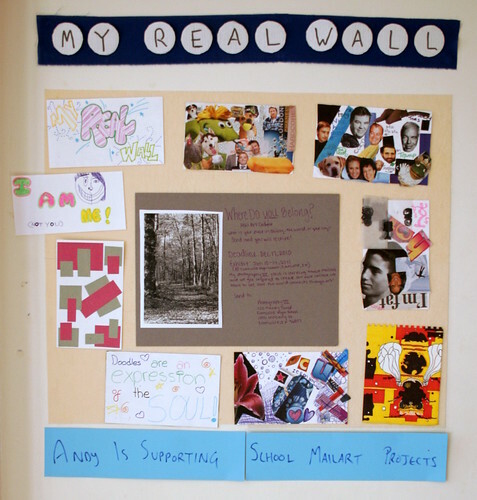 my REAL wall – Supporting School Mailart Projects, originally uploaded by andytgeezer. As a former teacher, I love to see students getting involved in mailart, and lately I’ve been lucky enough to be on the receiving end of some of the mailart produced. Todays posts on the REAL wall come totally from schools, one in the UK and one in Indiana in the US. All of the pieces on the outside are the fruits of my mailart lecture a while back. One of the student art teachers who attended is now working at a school called Glenthorne, and has taken up mailart as a way to get the students into art. I have a confession to make about Glenthorne. I was very surprised to find a bunch of post from Glenthorne in my postbox, as I myself taught in that school 6 years ago in exactly the same circumstances! 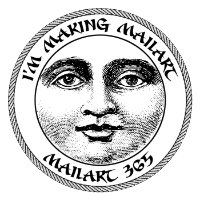 When I was training to be a physics teacher, Glenthorne was the first school I was sent to and I have a lot of love for the place, so thanks to all of the students there who sentn mailart my way – I think it’s great! Schools into mailart part 1 – Where do you belong? 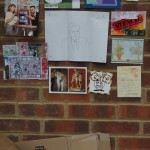 my REAL wall – Where do you belong?, originally uploaded by andytgeezer. A while ago, someone called Ann contacted me about putting up her mailart call on my REAL wall and I agreed to do so as it sounded intriguing. Ann is part of a photography class is Zionsville, Indiana in the USA and as part of their course they have decided to make and send out their own postcards and they asked me to post their poster for their mailart call on my REAL wall, which I will do. The mailart call theme is “Where do you belong?” (in society, the world, your role, where you would like to live). Good luck with that and I’ll be sending something your way soon! my REAL wall in Dublins National Gallery, originally uploaded by andytgeezer. It’s been a while since the last time that your postcards got me in trouble, but this one got me a telling off from a security guard. Me and Elena have just spent the week in Dublin, Southern Irelands capital, where we’ve just been recharging our batteries and taking your postcards for a walk. 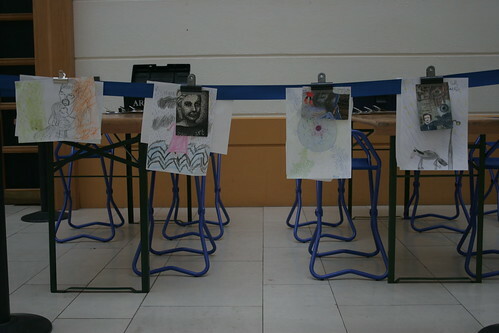 In the corridor of the gallery, they had set up a few tables and chairs with crayons and A4 paper. Being on an artistic bender at the moment, I decided I had to draw, and knocked out that pic on the left. Deciding to leave it there, I pinned it to the display and thought it would look a whole lot better with a load of your postcards, but couldn’t bring myself to remove all the great stuff by the kids, hence why your postcards are barely visible! Anyway, the telling off came when I got my camera out to photograph the scene. Just as I took the shot, a security guard came over and said, "No photography allowed in the building" and looked at me sternly. Anyone would think I was trying to take a picture of the Caravaggio that they have on display and not crayon drawings by under-10s! Anyway, I left feeling very pleased with myself after having created this piece, until Elena said "Maybe you should have signed that ‘By Andy, aged 30’ to give it a little perspective against the other pieces there"
She knows how to put me in my place! 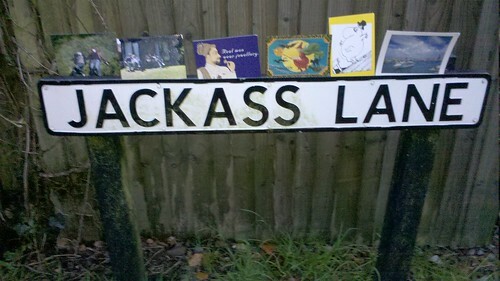 The postcards of Jackass Lane, originally uploaded by andytgeezer. At the moment, Elena and I are going on a lot of walks through the autumnal countryside of southern Britain in our weekends. Most of the time we leave the house, we take a bunch of postcards with us too, so that they can share the view. After all, England has some of the most wonderful countryside. Today we walked from Woldingham to Oxted in Surrey, on one of the most beautiful routes we’ve ever walked. The autumn leaves blazed deep red lining the wood fllor and this route was puncuated at intervals with tranquil and beautiful ponds which took our breath away. Unfortunately for you, I forgot to pack my trusty blu-tac, which would have allowed me to stick your postcards on trees and that sort of thing, so you’ll have to miss all these sights and content yourself with a humorous roadsign that we saw instead, which was about the only place I could safely park your postcards. 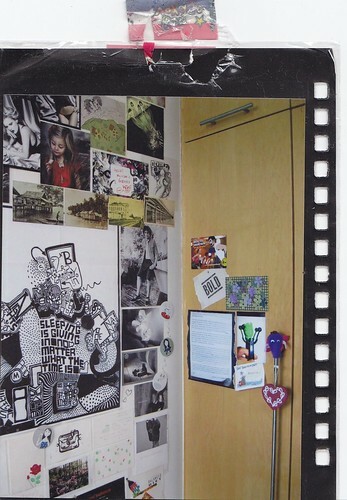 your REALwall – post from Ammy from Singapore, originally uploaded by andytgeezer. Ammy has been a long time correspondent with my REAL wall and I am proud to say that I’m on her postcard list, so when she goes away I get postcards from exotic places. Recently I sent Ammy a card for her wall and you can see that she’s now run out of wall space, so mine is on her wardrobe. Ammy is on her way to Macau and Hong Kong soon, so keep your eyes peeled for some more post from the far east soon. 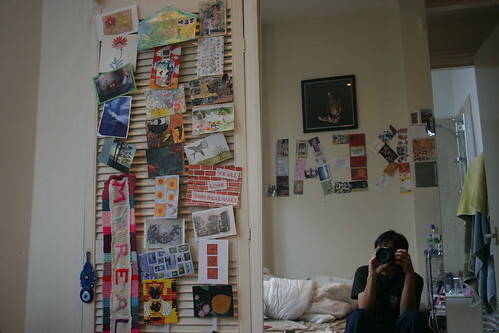 This is the second pic of one of Ammy’s walls with one of my postcards that I’ve received from Ammy’s camera, the first one shows that Ammy is as keen on postcards as I am! 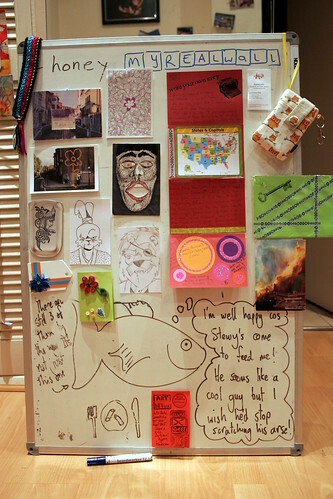 I’d love to know who sent some of those other pieces – is that a Grthink piece on the main wall perhaps? Stars of the show, originally uploaded by andytgeezer. The first of 3 REAL walls tonight and the first to be taken on my new iPod to test it out. As you can see, it doesn’t handle low light too well, which isn’t altogether surprising. Most times when me and Elena go on a long trip, we take along some of your postcards for the trip too, and this weekend we went away with my best mate Stew to the New Forest in Hampshire, down to the south. 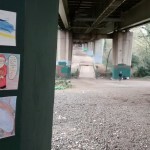 All of the postcards on the first of tonight’s walls came with us, as they all went up in this weeks mailart lecture, but we had such a great time riding horses and mountain bikes that we forgot to put up any REAL walls on the trees or amongst the autumn leaves. 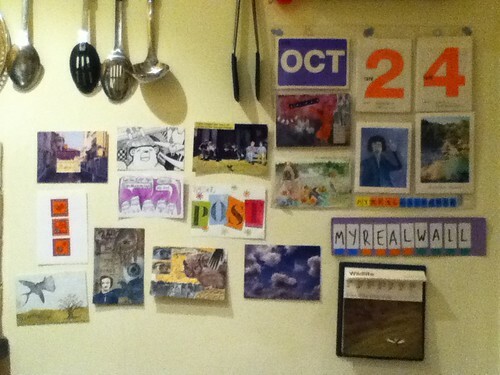 my REAL wall – Reasons to be cheerful, originally uploaded by andytgeezer. My REAL wall today contains a whole lot of things that have brought a smile to my face this week and I want to walk you through some of them in detail. Last week I ran my first mailart lecture at the university that I work at, and as a result I’ve received a lot of supportive mailart and post. All of the pieces I received mention the lecture and it’s been such a pleasure to know that mailart has touched so many people. Feltypants, who sent me the postcard in the top right was one of the mailartists that was with me in the very first Twitter #mailart swap, and we have become regular correspondents, both by mailart and on twitter. Earlier this month, Feltypants said to me "Mailart absolutely gave me the confidence to pursue my art & painting. It was a great way to test out showing my work to others & I got great feedback, wouldn’t be arting now without that" How’s that for praise of the art! Another contributor to the #mailart project was @museumnerd, whose cut out mask can be seen in the centre. This is on display again, because I aent it by Royalmail a few months to a friend, who was meant to take it to Dubai to do some REAL walls. 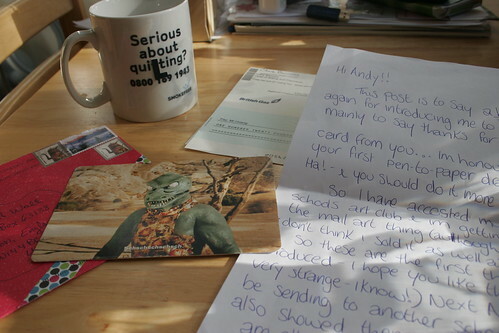 However, it got lost in the post, and 2 months later, via a message on Twitter to @Royalmail, I got it back today! In the top right hand corner is my new mobile phone case, which was handmade by S.P. Grimm, who goes under the name KapomCrafts on Etsy. I only started getting into Etsy this week and made my first purchase from Pal Grimm this week, who customised an iPhone case for my Motorola Milestone/Droid and sent it out so quickly. Elena loves my case and has now confiscated it until her own Etsy case comes through. Meh. B, The Snail Mailer and my newest regular writer has written again to put me straight on a few issues. Last time I received a postcard from B, who lives in Bethlehem, PA, I had assumed that PA stood for Pasadena. Apparently it stands for Pennsylvania. Yes yes I know I’m a dumb Brit, but honestly we don’t hear much about Pennsylvania where I live. I’ve now found out that Pasadena is actually in California, so I consider myself now educated. B has also included a handy map, which I shall revise thoroughly next time I make any comments on American states. The quilled pieces are made by Elena, who is learning to quill at the moment. She’s getting better and better, and is putting all her creations up on her flickr site. Drop by and give her some encouragement! The other postcards were donated to me by Stevie at work. At she heard I collect postcards, she decided that she should give me all the postcards she had, and I thought that that deserved a spot on the wall. The fish in the background was drawn by my best mate Stew, who looked after our fish when we went on holiday a few months ago. When I came back, he had drawn a fish on our whiteboard that made us both smile, and I’ve never had the heart to erase it. With all the great stuff I’ve got from distant and close friends, it’s hard not to feel loved. That’s why this wall makes me particularly happy. And with all this support, I felt like it was time to do something amazing myself. Last week during my mailart lecture I said I had always been uncomfortable with drawing. However, my students were so encouraging about my artistic abilities, that I left feeling an urge to overcome my fear of drawing. Inspired by Stan Sakai’s wonderful comic "Usagi Yojimbo" I decided to go home and put pencil to postcard and made my first ever REAL drawing, which was of Usagi himself! So fired up was I after that, that I went on to draw Katsuichi from Usagi Yojimbo too. I’m really proud of them and I’m even more proud that my students have made an artist out of me. The support that mailartists give each other is great, and I hope that through my REAL wall and my lectures and shows that more people can discover their inner artist. my REAL wall at Hampton Court Palace, originally uploaded by andytgeezer. Me and Elena went to Thames Ditton this afternoon for a talk and short film about Oxfams latest campaign against climate change. 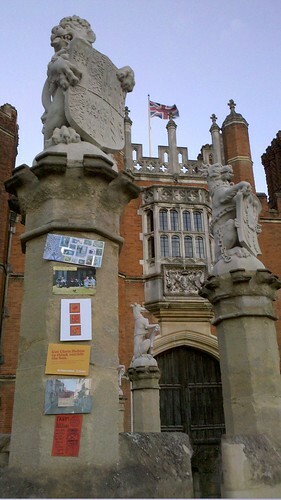 After the presentation, we walked over to Hampton Court Palace and posted your postcards on a wall at the Great Gatehouse. Bianca Jagoe from Australia, who runs Goodnight Little Spoon, and in my opinion is a wonderful doodle artist. She’s far too modest about her talents I feel as well! Katie R, IUOMA’s newest mailartist, who is only starting to get the thrill of mailart in her mailbox. Those first ones will stay with you forever I promise you! Feltypants‘ new card which came in this morning just as we were leaving our house. This piece is fab, and echoes my own work, with a transparent slide embedded within a slit card. Great execution Feltypants, I love it! Katerina Nikoltsou from Greece, one of the most active mailartists of the moment.